Many folks may not realize this until they're renovating or building a new kitchen, but cooktops and ranges aren't the same thing. While they both get delicious warm meals on the table, when it comes to buying a model, one is going to be preferable to the other for certain homeowners. Curious what the difference is – and which one is the better match for you? Read on before heading out to make a purchase. For the most part, whether you want a high end cooktop or designer range top has less to do with how you cook than what your cooking space looks like and what sort of aesthetics you're looking for. To start, range tops take up more counter space and extend over the front of your cabinetry – or the accompanying oven, if you're looking for a free-standing range. For range tops, control knobs are featured on the front of the unit. Folks who want a commercial kitchen look in their home might want to choose a range top – but freestanding ranges are also great for economy of space, since they come with an oven equipped. Cooktops are a different story altogether. Set right into your countertop, you'll find the knobs for your cooktop along the side of the burners, rather than overhanging the lip of the counter. This is useful for households with children – who won't be able to reach these knobs – and even has its benefits in a tight or narrow kitchen, where cooks won't be accidentally knocking into or turning outward-facing knobs while moving around. The big difference with a cooktop is that it's separate from your oven. Some homeowners prefer this, especially if they want to install a double wall oven, which is useful for tackling multiple cooking or baking projects at once. Double wall ovens are useful, but not for everybody. And homeowners with limited space who dream of the luxury of having two ovens should keep in mind that many free-standing ranges now come with bottom warming drawers, which won't cook your food as fast as an oven but can keep one dish warm while a second finishes. Whether you choose a cooktop or a range for your kitchen, there's still more to consider. Your cooktop/range will be one of three varieties: gas, electric or induction. Which style you choose depends on the kind of cooking you want to do. Gas ranges are the most traditional choice, and they're still the preferred range of many professional cooks as they allow for greater temperature control, especially at low flame. 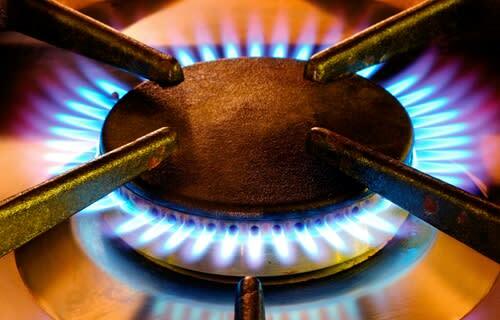 Gas also heats the element more quickly than electric, although high end electric cooktops/ranges are catching up. Generally speaking, many homeowners cite convenience as the reason to get an electric model – particularly if you've invested in a flat ceramic or glass cooktop/range. Since they don't have coil elements, these models are extremely easy to clean with the wipe of a cloth when cool. They're also a popular choice for folks who aren't comfortable using gas or don't have access to gas lines. Induction cooktops/ranges are yet another alternative, and they have a devoted fanbase. Unlike electric and gas units, which warm pots and pans on an open flame or heated to cook food, induction cooktops/ranges use electromagnetism to heat the cookware directly. As a result, the cooktop/range itself never actually gets warm – it stays cool to the touch the entire time you're preparing your food. It's a popular choice with chefs who say it has a wide range of precise heat controls, but is also a favorite of parents who don't want to risk kids reaching up and touching hot burners. Beyond cooktop vs. range top, or deciding between gas, electric or induction models, there are other features you'll want to keep in mind as you shop. For instance, how many burners do you want? Is the size of your range important? Do you want dual fuel, which offers homeowners both a gas and electric option? Is it important that your appliance come with an LP conversion kit so you can switch to propane gas if necessary? Depending on what kind of model you choose, you'll also need to make sure you have a gas line or dedicated circuit handy. If one or the other isn't available, you may need to do some essential kitchen remodeling first before installing your unit.